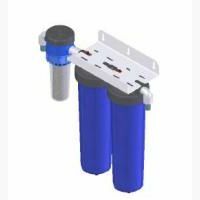 Delta 2 Whole House Water Filtration System- a 3-stage water filter for the whole house with additional heavy metal removal. Finally through the carbon block filter, which is effective against a wide range of chemical contaminants, including chlorine. The Delta 2, and its sister the Delta, are the only whole house filters that removes heavy metals. Start enjoying safe, healthy, chlorine-free water right away. Reduce the strain currently placed on your immune system and you may even get rid of long-standing symptoms - from sinus and respiratory problems to dry, itchy skin. It is just as effective in taking out the same harmful elements as the other whole house filters but with the addition of heavy metal removal. Connected to the incoming mains water supply it is suitable for use in a 4 to 7 person house, double the Delta. Check that the main stopcock is open and that the mains water is still on. Check the bypass valves 1 and 3 are fully open. Check that you have removed all the wrapping from a new filter cartridge. During periods of high water demand the pressure may fall. If running a bath or other appliance at same time your water pressure may drop to those appliances. Check that the bypass valves 1 and 3 are fully opened. Check bypass valve 2 is fully closed. Check bypass valves 1 and 3 are fully open. Check sealing washers on the main filter cartridges are in place. Condensation on the outside of the filter housing may occur, resulting in a frosted appearance of fine water droplets on surface. This does not of course mean that there is a leak in the system. Insulate the area around the filter, or reposition it. In the event of a leak carefully examine its source. Water from a leak may run along the pipe work - it may drip, or collect, some distance from the actual position of the leak. Ensure that the ‘O’ seals and the areas in which they are located are clean. Any small piece of debris on the seal of the surrounding area could cause a small leak. Apply a smear of silicone grease to the seal. Ensure that the filter housing is screwed fully onto the head works. This is essential both for the internal seal and the housing seal. Check that you only have one seal at each end of the cartridge. Leaks occurring at the elbow joints or centre connection will require the fitting to be removed. Re-apply plenty of PTFE tape and re-assemble and test. One of the most efficient whole house filters out there and is extremely cost-effective to run. It’s suitable for large households. Filtration of particles and sediments above 1 micron. Improved condition of skin and hair. Easy to maintain and you are added to a reminder system so we can alert you when you should think about changing your cartridges.